As Canadian pot producer Aphria Inc. tells it, the farm is part of its growing portfolio of international assets. 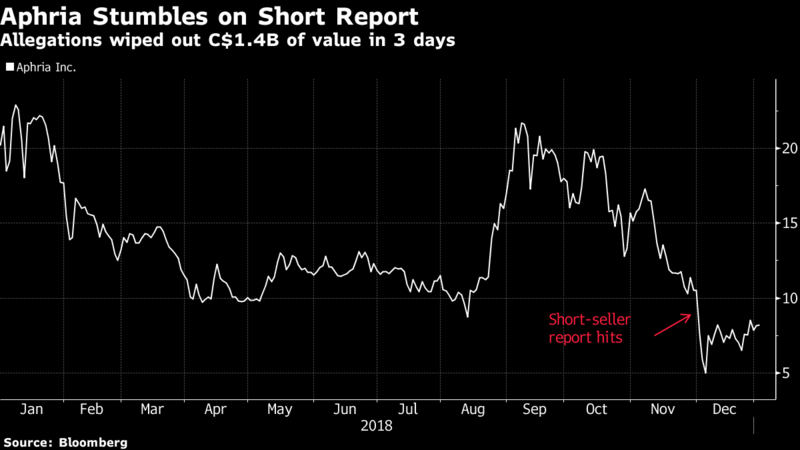 For two U.S. short sellers, it’s one of the catalysts for an offensive that sent Aphria shares plunging in December. Hindenburg Research and Quintessential Capital Management questioned the farm’s existence and said Aphria overpaid for “largely worthless” assets in a three-country deal. The truth, as uncovered by a tour of the Jamaican countryside and the back streets of Buenos Aires by Bloomberg, is more nuanced. In the nascent world of global pot investing, assets can be hard to document and even harder to value, though first-mover advantage may hold big rewards. Aphria acquired LATAM Holdings Inc. in a September deal that the Leamington, Ontario-based company valued at $193 million when it was announced and SOL Global Investments Corp., the seller, said was worth $298 million when it closed. The assets include Marigold Projects, a licensed Jamaican grower, a pharmaceutical distribution warehouse in Argentina and licensed farmland in Colombia. In mid-December, black and yellow plastic tubs brimming with medical-grade marijuana were stacked inside an old shipping container on the Marigold farm. The haul is the product of 2,500 kilograms (5,500 pounds) of weed it harvested from 10 acres of former sugar cane-growing land leased from the government, proof Aphria says, the assets have value. Hindenburg and New York-based hedge fund Quintessential called the acquisitions part of a “shell game” to funnel money to insiders at an inflated price. The Dec. 3 report sent Aphria’s stock down by about half in three days, wiping out $1.4 billion in market value. Aphria called the report “malicious,” false and defamatory, and said the deals were backed by a fairness opinion from Cormark Securities Inc., a Toronto investment bank. Aphria has also appointed a special committee to review the acquisitions and named Irwin Simon as an independent chairman, replacing Vic Neufeld who remains chief executive officer. Hindenburg has urged Cormark to make the fairness opinion public. Aphria is scheduled to report earnings for its fiscal second quarter on Jan. 11. The company has not yet released the detailed, line-by-line rebuttal of the short report it told BNN Bloomberg it would issue. Located an hour’s drive from Kingston in St. Catherine parish, the farm is tucked about 250 meters off the road, surrounded by a chain-link fence, patrolled by armed guards, and monitored by dozens of security cameras. Tomlinson, a lanky, bald Jamaica native, said he started the operation in 2015 after obtaining a renewable, 25-year lease from the government. He declined to say how much he paid for the lease. The October-November harvest is the largest, according to the company, but the climate can support as many as three harvests a year. Tomlinson said the farm has the capacity to increase its production substantially to 16,000 kilograms a year. He’s never been contacted by Quintessential, he said. Aphria said it received a Tier 3 license for the farm, allowing it to cultivate five acres or more. In an emailed response to questions, Quintessential stood by its research and said the farm “is of little importance for the purpose of valuing the assets of the company” because Marigold leases the land, instead of owning it. It also doubted the 2,500 kilogram output claim. “The only asset that Aphria appears to have purchased is a Tier 3 cannabis license,” Quintessential said. Douglas Waterson, portfolio manager at Faircourt Asset Management, discusses his outlook for the cannabis sector after stocks took a downturn after legalization. Aphria can’t yet export its Jamaican weed, as the country currently doesn’t allow it. The government plans to introduce a bill to parliament early this year that would allow for commercial shipments abroad, according to the Cannabis Licensing Authority. Initially, the company plans to focus on the local market, selling to the 2.9 million residents and the more than 4 million tourists who visit annually. Bloomberg found the store well marked on the second floor, above a pizza-by-the-slice and Jamaican beef-patty joint. Inside, the store was built out, but shelves and display cases were empty. A second room, in which a leather couch sat, was built for smoking on the premises. A sales manager who asked not to be identified said they plan to have a medical doctor on site who can write prescriptions to some of the 3,000 customers they expect each week. Marigold has three other retail sites that aren’t yet open, according to copies of the approvals seen by Bloomberg. Quintessential, in response to questions, said it couldn’t locate the business because Aphria had published the wrong address for Sensi. In Argentina, Aphria’s subsidiary ABP SA is remodeling a warehouse in the residential Parque Patricios neighborhood of Buenos Aires. The four-story building is not operational, according to three construction workers who asked not to be named. The entrance hall has an empty reception desk, four waiting chairs and eight official authorizations posted on the wall granted by local regulatory bodies. ABP also runs a drug store called Farmacia & Perfumeria. Aphria said ABP also distributes to a network of pharmacies, clinics and hospitals and that it’s delivered 1,500 bottles of an oil derived from cannabis for use in clinical studies on treating refractory epilepsy in children. The LATAM deal was funded by the issuance of 15.7 million common Aphria shares plus the assumption of US$1 million in debt. Quintessential and Hindenburg said in their Dec. 3 report that this amounts to about $280 million based on Aphria’s share price when the deal closed, and the Jamaican assets made up $145 million of that total. Aphria said the deal was worth $193 million when it was announced in July and the seller of the assets said it received approximately $298 million when the deal closed in September. Neither Aphria nor the seller gave a value for the Jamaican assets. Aphria said the price paid was comparable to similar acquisitions made by other Canadian cannabis producers. Bank of Nova Scotia analysts Oliver Rowe and Ben Isaacson said the $193 million price given by Aphria at the time of the announcement was more appropriate, “as this was the value management had control over” when they entered the deal. They estimated the Jamaican assets to be worth about $45 million and pointed to similar deals done by Canopy Growth Corp. and Aurora Cannabis Inc.
Canopy agreed to pay an initial US$34.8 million in shares for Spectrum Cannabis Colombia S.A.S, giving it 42 licensed hectares of production capacity. Aurora paid $290 million to acquire ICC Labs Inc., which gave them two greenhouse facilities, three outdoor grow sites and two under-construction facilities in Uruguay and Colombia. In Colombia, Aphria purchased a 90 per cent stake in Colcanna, which it said has an office and 34 acres of farmland in a coffee-growing region about 200 miles west of Bogota. “These transactions indicate to us that Aphria’s purchase price of $193 million for Colombia, Argentina and Jamaica is, at the very least, rational and perhaps even relatively inexpensive,” the Scotiabank analysts wrote in a note. Ultimately, the LATAM acquisition is a small part of Aphria’s total assets, which include Canadian production capacity that’s expected to reach 255,000 kilograms annually in 2019, $314 million of cash on its balance sheet and supply agreements with all the Canadian provinces.